Greetings in the Name of our Lord and Savior Jesus Christ! 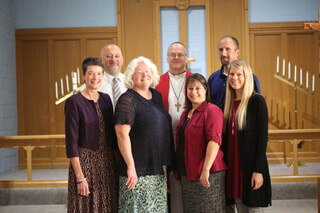 Trinity Lutheran Church and School web page. God welcomes us to join together with our fellow brothers and sisters in Christ around His Word and Sacraments. As we live our lives from day to day God strengthens our faith. We invite you to come and join us in receiving God's gifts during our Divine Service or at any of the Bible studies, Sunday School or other activities that we offer. May God continue to bestow His blessings upon you as you live each day that He has given to you. ​ join us for Worship!